After the death of Eärendur, the 10th King of Arnor, the kingdom was spilt into three separate kingdoms under each of his surviving sons. This was allowed by Eärendur’s eldest son, Amlaith due to his two younger brothers disputing his claim to the throne, because he wished to prevent the impending civil war the brothers would bring. 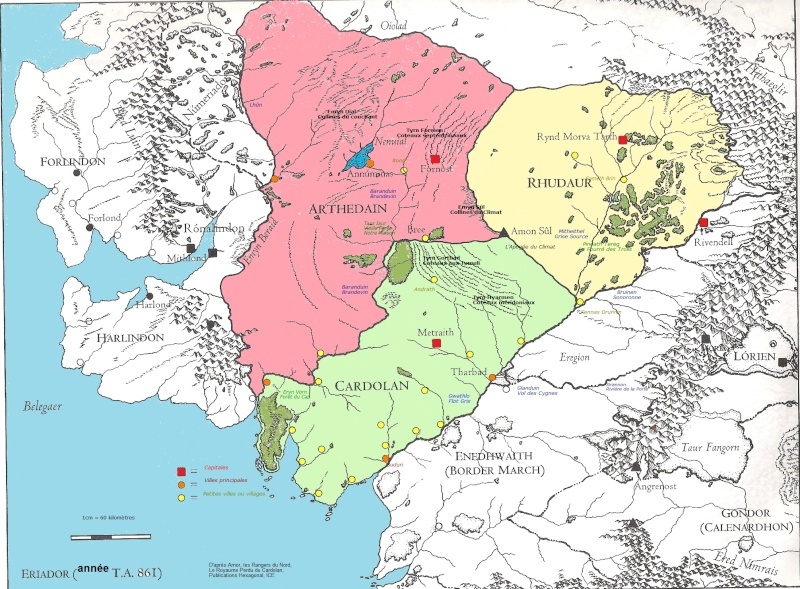 The kingdoms were split into the smaller kingdoms of Cardolan, Rhudaur and Arthedain. Of the Three Kingdoms and Kings, only the names of the Kings of Arthedain are still known today. Before we go through the lists of the Kings of Arthedain, I think it is prudent to take a look at the geography and histories of the other two kingdoms first. Rhudaur extended from the Weather Hills to the river Bruinen (Loudwater). It shared the Great East Road border with Cardolan and with Arthedain along a line of the Weather Hills. Rhudaur also contained the region known as The Angle, which was the land lying between the Mitheithel and Bruinen rivers. This is the area where the Stoors first migrated into Eriador from east of the Misty Mountains. Rhudaur is Sindarin for Eastern Forests, but can also be translated to Evil Wood. From the start, Rhudaur was sparsely populated with a mixture of Dύnedain and lesser men. The kingdom was constantly at war with Cardolan and Arthedain, contesting ownership of the Weathering Hills and the fortress of Amon Sύl (Weathertop) and the Palantír associated with the fortress. Over time, Rhudaur’s Dύnedain population was vastly outnumbered by the Hillmen. With the help of Angmar, one of the Hillmen leaders seized power in the 14th century. This led to the Stoors living in The Angle to flee south to Dunland or back eastward to the Vale of Anduin. Angmar then annexed and terminated the kingdom of Rhudaur in T.A. 1409, killing the remaining Dύnedain who had not already fled. Two hundred years later the waning population of Rhudaur was further decimated by the plague sent forth by the Witch King. Cardolan stretched from the river Barabsuin (Brandywine) to the west, the river Mitheithel (Hoarwell) to the east and the river Gwathlό to the south-east. It’s northern border was the Great East Road. Cardolan is Sindarin for Red Hill Country. As did the other two kingdoms, Cardolan claimed the Weather Hills which also included the fortress of Amon Sύl, later commonly referred to as Weathertop. This was due to the Palantír that resided there. The Weather Hills were contested by all three kingdoms until Rhudaur fell under Angmar after the line of Dύnedain kings fell there. When Angmar arose in the North, Cardolan allied with Arthedain and they fought the combined armies of Angmar and Rhudaur. The peoples of Cardolan migrated toward the capital region of Tyrn Gorthad which was devastated by an attack from Angmar in 1409. The king of Cardolan was slain in the attack and Cardolan ceased. The area of Tyrn Gorthad became known as the Barrow-downs and entered hobbit legend. Arthedain was bound in the north by Forochel and the west by the Lune. The former capital city of Arnor, Annύminas was located at Lake Nenuial in the north which was in the territory of Arthedain, though the capital was moved to Fornost. The First King of Arthedain, High King of the Dύnedain was Amlaith, son of Eärendur. Amlaith was the true King of Arnor but allowed the kingdom to be split into three separate kingdoms to prevent an impending civil war due to his younger brothers’ refusal to accept his ascension to the throne. Though his reign was peaceful, there were small border disputes with the realms of Cardolan and Rhudaur which never fully ceased. Unlike the former kings of Arnor and before them the Kings of Nύmenor, he did not take a name in Quenya, but rather a Sindarin name. Amlaith died in T.A. 946 and was succeeded by his son Beleg. During King Beleg’s reign, halflings were seen entering Eriador from the Misty Mountains. At this time Sauron also first entered Mirkwood. Beleg died in T.A. 1029 and was succeeded by his son Mallor. During King Mallor’s reign, the Istari entered Middle-earth, though their origins were unknown. The shadow that had fallen over Mirkwood was found to originate from Dol Guldur, though Sauron’s presence there was still unknown. King Mallor died in T.A. 1110 and was succeeded by his son Celepharn. During King Celepharn’s reign hobbits continued to enter Eriador through to the lands of Arnor. Gondor had, at this time reached the height of its power. Celephran died in T.A. 1191 and was succeeded by his son Celebrindor. King Celebrindor’s rule was peaceful and mostly uneventful. Relations with both Cardolan and Rhudaur were good. Celebrindor died in T.A. 1272 and he was succeeded by his son Malvegil. Under King Malvegil’s reign the kingdom of Angmar was established by the Witch-king north of Rhudaur. Evil things began to appear in Arnor. Men and Orcs began gathering on both sides of the Misty Mountains. This was the end of the peaceful times in Arthedain and the split kingdoms. During this time both Rhudaur and Cardolan failed. Malvegil died in 1349 and was succeeded by his son Argeleb I. King Argeleb I again claimed lordship of all of Arnor, which the remnants of Cardolan accepted. Rhudaur had by this time fell under the control of Angmar and resisted his rule. Argeleb was forced to fortify the hills at Weathertop where he was killed by evil men from Rhudaur in T.A. 1356. Arveleg, Argeleb’s son, became king at his father’s death. With the help of Cardolan and the elves of Lindon he was able to drive back the forces of Angmar and avenge his father’s death. Rivendell was besieged by Angmar as Arthedain and Cardolan set a watch on the great road and the Whether Hills. A great host from Angmar broke these lines and Arveleg was slain. The fortress of Amon Sύl upon Weathertop was destroyed, but the Palantir was saved and taken to Fornost. The Hillmen of Rhudaur killed any remaining Dύnedain and that land became a fief of Angmar. Cardolan was ravaged. Arveleg was succeeded by his teenaged son Araphor. Araphor took the throne in T.A. 1356 at the death of his father. The young king was able to push the forces of Angmar back from Fornost and the North-downs with the aide of Cirdan of Lindon while Dύnedain refugees, the remnant of Cardolan and Rhudaur, held out in the Barrow-downs and Old Forest. Elrond arrived with reinforcements from Lothlόrien and drove the Witch-king’s armies back into Angmar. Many of the Hobbits in Eriador fled into Wilderland. King Araphor died in T.A. 1589 and was succeeded by his son Argeleb II. King Argeleb II ruled when the Great Plague reached Eriador. The men of Cardolan almost all perished and the hobbits and other people living in Arnor suffered greatly, though the plague lessened as it went northward and the men of Arthedain were barely affected. Angmar sent evil spirits into Cardolan and they dwelt near the Barrow-downs. Argeleb II granted the lands east of the Barabsuin to the hobbits, which was called ever after the Shire. Arvegil, son of Argeleb II succeeded his father in T.A. 1670. During his reign, the hobbits migrated from Arnor into the Shire. As the Great Plague had taken the lives of many Dύnedain, it also took many of the evil men and Orcs from Angmar. This led to a rather peaceful and uneventful rule for Arvegil who died in T.A. 1743. He was succeeded by his son Arveleg II. During Arveleg II rule, war with Angmar broke out again, though the Witch-king’s people recovered faster than the Dύnedain had, and were reinforced by Easterlings and Orcs. Arveleg Ii died in T.A 1813 and he was succeeded by his son Araval. King Araval renewed the alliances with the Elves of Linden and Imladris. He also reestablished ties and friendship with the Kingdom of Gondor. After a victory in Angmar, he attempted to recolonize Cardolan but was foiled by the Barrow-wights of the Barrow-downs who frightened away and killed any settlers. Aravel died in 1891 and was succeeded by his son Araphant. During King Araphant’s reign, Malbeth the Seer predicted that Araphant’s son, Arvedu, would be the last king of Arthedain. Araphant continued his father’s policy on renewing ties with Gondor eventually organizing the marrage of King Ondoher’s daughter Firiel and his son Arvedui. After Ondoher’d death, Arvedui attempted to claim the throne of Gondor through his blood connection to Isildur, but was rejected by Gondor’s Steward and Council. Araphant died in T.A. 1964 and Arvendui ascended the throne. Soon after Arvendui’s ascension to the throne, Angmar attacked Arthedain, driving the Dύnedain back. Arvendui and his guard hide out in old dwarf mines located in the Blue Mountains. Gondor sends help over the sea, which comes too late as Arthedain is overrun. Starvation draws Arvendui and his men from the mines and into Forochel. The Lossoth of Forochel assists the King. Cirdan sends a ship to retrieve Arvendui. Though the Lossoth warn the King not to board the ship, he gives the Ring of Barahir to the Lossoth Chief with words to sell it back to his kin, the Dύnedain as ransom. The ship is crushed in the Ice Bay and the king drowned. The two Palantiri he carried with him were lost in the frozen sea forever. Shortly afterward, Gondor arrived and destroyed Angmar with the help of Cirdan, but Arthedain was completely lost and all of Arnor was no more and the kingship had ended. Arvendui’s son Aranarth became the first Chieftain of the Dύnedain. The line of Isildur remained unbroken. This links me via tapatalk to a recruit page. Maybe it's just the app. Yeah. These auto-generated threads don't work right because the forum was upgraded from phpBB2 to phpBB3 to vBulletin 3.x to vBulletin 4.x. The structure is a little whacked out because there are multiple forumid=0, threaded=0 and postid=0. I have these threads set to post into a forum that does not exist so that anyone but me can see them, or rather that is how it is supposed to be. They do show up under the Latest Threads and Newest Threads filters though. To read new articles, skip the link and go to the Articles section. Sorry to derail the comment thread, but this is one of the best articles of all time. OF ALL TIME. Seriously, though this is the part of M-e history that gets talked about the least but their artifacts are the ones we see the most of. Indeed. I really dig the map, too. What's the source? Can it be embiggened? The two reference I used was The Return if the King Appendix A sections titled The Realms in Exile and The Northern Lines: The Heirs of Isildur. I also used The Peoples of Middle-earth (HoME Vol 12) section titled The Heirs of Elendil. There are some parts that can be expanded on a little more than I did, but since most of it is mostly a rough draft of an undeveloped outline, I decided to keep the entire essay short. I can try and expand on something if someone has something specific they want more of. Oh hell, you meant the map. I'm not sure where I found it. I'll try and locate it again, but if I remember that size is around the actual size of the image as it displays here. That is where I found it. It is good at showing the boundaries but does not enlarge that well and is in French I think.